Abraham Joel Molascon was born September 23, 2011 9:35 AM to joyful and proud parents at Avera McKennan Hospital in Sioux Falls, SD. 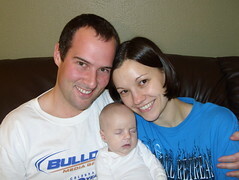 On November 4, we all finally went home to our house in Madison, SD. 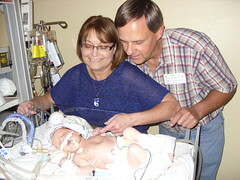 Abe and his parents lived at the NICU of the hospital for six weeks because Abe was born with a condition known as congenital diaphragmatic hernia (CDH) which means there was a hole in the muscle that separates his gut and his chest. 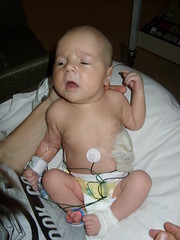 The hole allowed Abe’s stomach, spleen, appendix and much of his bowel to move into his chest which pushed his heart to the right side of his chest and limited the growth and development of both his lungs especially his left lung. CDH requires surgery to move the displaced organs from the gut back into place and close the hole in the diaphragm. The entries below are a record of baby Abe’s journey. It’s so good to be home! We’re trying to figure out our routine. Abe seems to prefer to take cat naps instead of longer naps, which is unfortunate for me because I don’t do cat naps well. He’s up every 2-3 hours during the night to eat. Of course I’d be happy if it were longer stretches, but right now it’s more important that he gains weight. 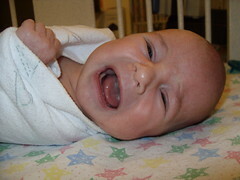 Abe is happiest in the morning, and in the afternoons he’s a little fussy. He definitely likes to be held and cuddled which is great but I don’t get much done around the house! I’m getting better at doing things one-handed, but I’m grateful when Joel is home during lunch and in the evenings to help. I did manage to make some pumpkin gooey butter cake (even better than pumpkin pie, I think) this week, which made me happy. :) For those of you in the area, we’d love for you to stop by and meet Abe. Just make sure you’re healthy and haven’t been exposed to anyone w/ a contagious illness recently (chicken pox, etc.). Please call before you come so that we can try to have you come at a good time for Abe. Make sure to wash your hands before you touch or hold him...we want to keep him as healthy as possible. We look forward to seeing you soon! 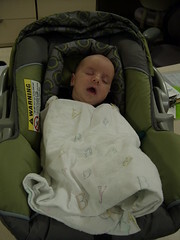 Abe had a check-up with his pediatrician the Monday after we got home. 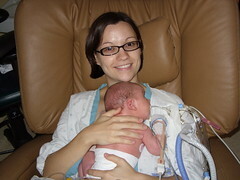 His weight was 8 lbs, 13 oz – It was 8 lbs, 9 oz when we were discharged from the hospital. Since it was a different scale and they didn’t zero out the scale for his diaper, I don’t think he gained 4 oz in those 3 days, but it was good that he went up instead of down. His direct biliruben had gone down again (from .8 to .5), but they want it a little lower so we continued his medicine for that. His hematocrit remained stable (I don’t remember the exact number), so that won’t need to get checked again. We had another check-up on Tuesday of this week. 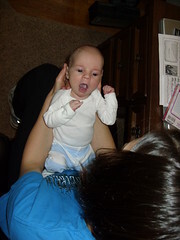 He weighed 9 lbs, 2.5oz – a gain of 5.5 oz in 8 days. Dr. Kooima said that was “decent” weight gain. The lab checked his total biliruben instead of the direct biliruben, so we’re continuing that medicine until our next appointment. Hopefully after that we’ll be done with medicines! On Monday we’ll be back in Sioux Falls to have a follow-up appointment with the surgeon and to see his pediatrician again to check his weight. Pending approval from both of those doctors, we’re hoping to travel to ND for Thanksgiving – with the caveat that we may turn around if Abe doesn’t handle the trip well. Eight hours is a long time! He does fine to and from Sioux Falls, but this will be a little more intense. Praise the LORD that we’re home and Abe is gaining weight! Thank you so much for your prayers for Abe and for us as we’ve been on this journey. We wouldn’t have chosen this path for ourselves, but we trust that God has been and will continue to be glorified through Abe’s life. What a testimony of God’s goodness and faithfulness! We’re surprised, too! Abe ate really well on Thursday (about 150 cc’s per kilo, which is what other babies his age are eating), so we were hopeful that he would gain weight. But he was down another 85g that evening, so we were discouraged. On Friday he was taking smaller amounts more frequently, and was on track to be at about the same rate as Thursday. We’d asked our nurses all week to talk to the surgeon if he stopped by, but he never did. So we asked if they could let him know we wanted to talk with him just to get an idea of what his requirements were for letting us go home. The neonatologists said in cases like this it’s more the surgeon’s call than theirs. So Dr. Karl, the surgeon on call, stopped by our room around 4:30 on Friday afternoon. We asked him what he was looking for before we could go home, saying that we knew he needed to gain weight. Dr. Karl’s response: “To hell with that. You can go home tomorrow.” We were thrilled! Dr. Karl went to talk to the neonatologist on duty to make sure the new neo coming on for the weekend knew that we had Dr. Karl’s blessing to be discharged. He came back into the room a few minutes later and said, “Tomorrow’s not going to work. It’s going to be raining, so you can go home today.” We couldn’t believe it! The neo was with him and said he’d get started on his paperwork and getting the ball rolling for discharge. Dr. Karl’s reasoning was that Abe is eating well, he’s not having issues with regurgitation, and he’s absorbing the breast milk well (indicated by his output), so there was no reason to think he won’t gain the weight. And he felt that it’ll be better for all of us to be home. We weren’t about to argue! We were especially surprised since one of the nurse practitioners had told us a few days ago that Dr. Karl is pretty strict about his requirements for babies going home and that he usually likes to see 5 to 7 days of weight gain after the IV is out. So we were thinking we were going to be there at least another week. We’re glad we were wrong! Joel picked up Abe’s meds from the pharmacy, I packed up our room, then we went through some discharge education. We had our last meal at the cafeteria, and we said goodbye to some of Abe’s nurses. They really do become like part of the family. It was 9:30 before we left the hospital, but we didn’t care. WE WERE GOING HOME! Today we’ve been working on unpacking all our stuff. It’s crazy how much we accumulated in our 6-week stint at the hospital. We’re going to lay low for a little while to adjust to being a family of three. As much as we want Abe to meet all of you, please give us some time to settle in and establish our routine at home. While Abe is out of the NICU, we’ll still have to be careful to make sure he doesn’t get sick because he’s more susceptible to respiratory issues anyway. When we’re ready for visitors, we’ll make you wash your hands well, and we’ll send you home if you’re not feeling well (just like they would at the NICU). We want to keep Abraham healthy so he doesn’t have to go back to the hospital. On Friday last week, Abe’s pain med was discontinued. He’s done great being off of it. One more hurdle overcome – one more prayer answered! However, his weight went down by 80 grams, which is about 2-1/2 ounces. Not the direction we want to be going. Saturday he gained back 50g (yay! ), but his IV stopped working overnight, so they had to put another new one in. (It only took 3 attempts this time – now in his left hand.) Abe almost doubled the amount that he ate from Friday to Saturday, so on Sunday the rate of his IV nutrition (TPN) was cut in half. They also took off his oxygen saturation probe, so that’s one less cord! 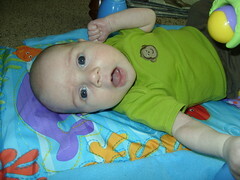 He started a multivitamin, and they said that if the IV comes out again, it can stay out (whew!). But he lost 35g. On Monday, he had his labs checked, and his hematocrit increased to 31 and his direct biliruben decreased to .8 – both went the direction we were praying for! 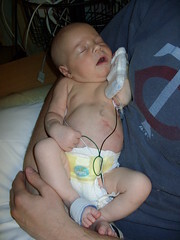 His weight went up 45g, but in the previous week he’d really gained nothing, so they kept the TPN going. Tuesday, his weight went down only 5g. They spun my milk and it has about 28 calories/ounce, which is a little higher than average I think. Another blessing! 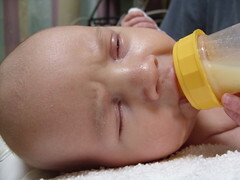 But to give him an extra boost, they’re fortifying any breast milk given via bottle (at least once during the night so I can sleep a longer stretch and occasionally during the day if we’re out for supper when he needs to eat). Wednesday morning, Abe’s IV went bad again, so they took it out and left it out. They checked his blood sugars twice afterwards to make sure they were above 60, and they were both around 90. If they hadn’t been, they might have had to put the IV back in again. The lactation consultant came by and suggested that we have Abe in our room so that I could feed him more frequently if needed during the night. She checked with the nurse practitioner, and she gave the okay! So Abe moved in with us last night (after Joel and I went out for supper). We’re not sure how long it will last, but we’re praying this will increase his intake and get us closer to bringing him home. His weight was down 45g last night, but the nurse said it’s probably because he is not getting the consistent fluid that he was with the TPN. They re-weighed him this morning and he was up 20g from Tuesday night. His intake per kilo was about 120, which is the highest it’s been since I’ve been paying attention to it. Ideally he should be at 150, but I think as long as he keeps gaining weight they’ll be happy. Yesterday Abe took greater amounts at a time from the bottle than from nursing, which is a little frustrating for me. Right now we’re happy with whatever he takes, but hopefully he won’t always prefer the bottle. That’s something we can work on once we’re at home. Abe’s intake to increase, and that rooming in will make a difference so we can keep him with us all the time! Abe gets to room with us! Even though we’re not back in Madison for my birthday like I’d hoped, it’s okay. I realized that “home” is where my family is, and right now I have two handsome men on either side of me, so I am home. We’re still eager to get back to our house in Madison, but we’re glad we can all be together now. We continue to have faith in the LORD and trust His perfect timing. I’m sure I’ll still get frustrated and discouraged at times, but we know this has all been part of God’s plan from the beginning, and He is good. Thanks for praying for all of us. 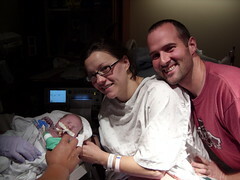 Abraham’s birth announcement on the Avera McKennan Hospital web site. Monday: Abe started nursing! He did well with some helps, but for a baby who is getting started a month late, he knocked the socks off everyone around here. His lab showed that his hematocrit (red blood cell count) was low, but they held off on any treatments til they did another lab. 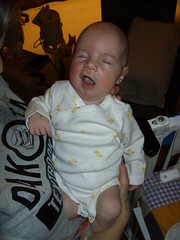 He also wore his first clothes (with one arm sticking out because of the IV in his left arm). Tuesday: Abe’s second lab (a retic count) was right at the cutoff (6) for not needing medicine because it showed that his bone marrow is producing new red blood cells. Dad gave Abe a sponge bath, and his oral pain med was changed from every 6 hours to every 8 hours. Wednesday: Abe’s TPN (IV nutrition) was decreased to 5.7 and his lipids (fats) to 0.8 because he was taking enough breast milk. His pain med was decreased to every 12 hours. 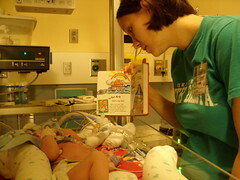 Thursday: Abe had an OT (Occupational Therapy) assessment (standard in the NICU) and everything she checked looked good. 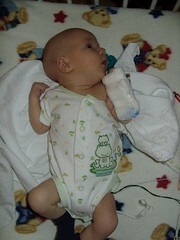 Abe’s TPN and lipids were discontinued and he was started on sugar water to maintain his fluid level. This was great news because it meant he was eating enough breast milk to not need any nutritional support…or at least they were giving him a chance to prove it. There was an order that if his IV came out, they could leave it out. The surgeons stopped by and were impressed with how Abe was doing. His pain med decreased to every 24 hours (I think the next step would be to discontinue it, but I’m not sure). Friday: Abe’s IV was leaking, but instead of taking it out and leaving it out, they put another one in (it took 5 attempts and now it’s in his left foot) because the surgeon wants Abe to continue with the TPN because he’s not taking enough breast milk per kg per hour (that’s how they figure things here). He’s taking between 30 and 50 cc’s every 3 hours, and they want him to be taking 60-80. I was pretty discouraged by the setback today because so many of the nurses and others we work with kept talking about how incredibly well Abe is doing, and one of the nurses even said goodbye to us in case we weren’t here the next time she worked. Abe IS doing very well, but he’s not making those big leaps and bounds like he was the week after surgery. It’s not looking like we’ll be home by my birthday, but I’m going to keep praying that we are. It all depends on how Abe does with his eating. Praise that Abe picked up on breast feeding so quickly! Thank you, once again, for your continued prayers for Abe and for us. We appreciate them so much, especially now as the progress isn’t as rapid as it was the past couple weeks. Abe is still exceeding expectations around here, and we’re grateful for that. Now I’m just getting impatient to bring him home, so those little setbacks are harder on me now. We’re so proud of our little man, and we love spending as much time with him as we can. We can’t wait to introduce him to all of you! Abe continues to do well! On Thursday, his pain medicine was decreased to 2.4, and he had a nebulizer-type treatment to help with his congestion (he was snorting occasionally). They took off the bandage from his right chest tube, and you can hardly tell it’s there. 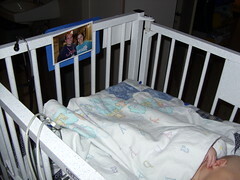 On Friday, Abe’s pain med was decreased to 2.0, and he was upgraded to a crib! 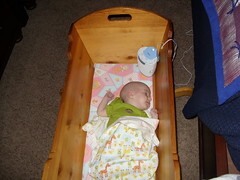 (He’s been in a warmer since birth.) Yesterday, they stopped his pain med through the PICC line, and switched him to an oral pain med that’s supposed to make the weaning process easier. Abe’s IV nutrition dose was lowered from 16.9 to 10.6 since he’s been consistently taking most of the full ounce of breast milk from a bottle. The bandages covering the surgery incision and left chest tube incision were almost coming off, so Joel played the Dad card and took them off himself. The surgery incision looks great! It’s a little over 2 inches long, and the surgeon told us there are 13 stitches for the patch on his diaphragm. 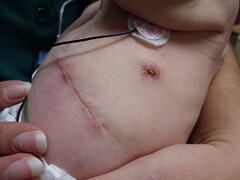 The scar from the chest tube will be a little worse, though, I think. It’s not as big, but there’s a scab and it’s wider. 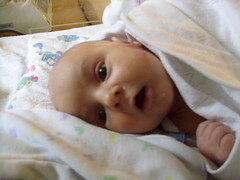 Today, Abe was moved to the 3rd floor NICU, which is for more stable babies, so it’s a good thing! Joel and I will stay in our room on the 4th floor, but Abe is now in room 3703. Abe’s PICC line stopped working this morning, so they took it out and put an IV in his other arm instead. He also got his Hep B vaccine, and he started another medicine to help with liver function (his direct bilirubin is high, which is common with long-term IV nutrition). Abe was pretty fussy this morning…in fact, the nurse called at 6 AM to see if we could hold him since they didn’t have enough hands. Joel was with him from 6:00 to 8:30, then I took over until 10:30. He got his next dose of the pain med shortly after that, and then he felt better. His cry is much stronger (and louder!) 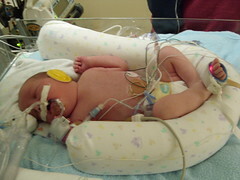 now than it was when they first took out the breathing tube. ;) He’s also having poopy diapers fairly consistently, which indicates that his system is working the way it’s supposed to. I’m still waiting to try nursing. I think they want Abe’s respiratory rate to be more stable (and stay under 70), but we need to get some clarification on that. Some of you have asked how Joel and I are doing…We’re doing well! We’ve gone through the 3-week cycle at the cafeteria, so we’re starting to eat out more (which is easier to do with Abe being more stable) using restaurant gift cards that have been given to us. Our days fill up quickly between feeding Abe (we try to feed him as much as we can, but we do let the nurses feed him at night so we can get decent sleep – we’re going to enjoy this while we can), eating, pumping, and visitors. It’s been a challenge for Joel to try to work from here, especially with Abe making so many huge steps forward last week. He is trying to work 20 hours a week from our room here and is currently using up his sick leave that he has saved up over the last several years. Joel and I have talked about staying at a hotel one night just to get a break from the hospital and to sleep in a big bed! (Yes, we’ve been sharing a twin bed here.) We’re so thankful that we can both be here with Abe, and I can’t tell you how wonderful it’s been to have Joel here with me the whole time. We’re extremely blessed that both of us are able to be here to love on Abe as he goes through all this. It’s also been a blessing that neither of us have gotten sick! We wash our hands all the time (and have had to invest in good lotion because of that), but we probably aren’t getting as much sleep as we should, so we’re grateful for our health so that we can continue to snuggle Abe as much as we want! We’re continually in awe of just how many people are praying for our precious Abraham, and we are continually thanking God for all our faithful prayer warriors. It really is incredible! We keep praising the LORD for all that He has done in Abe’s life and in this whole situation. The ventilator is turned off! WOO-HOO! Today has been another day of milestones. 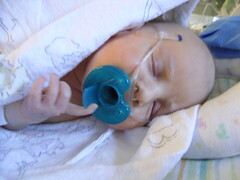 Abe decided he didn’t really need the nasal cannula for oxygen – it never stayed in his nose and wasn’t really providing much support and he was doing fine, so they got rid of it. Down 1 more tube! Currently he has 3 sensors on his chest/belly for heart rate and respiratory rate, 1 PICC line in his right arm where he gets his nutrition and medicines, and an oxygen saturation probe on his foot (total of 6). The 3 sensors will stay until he comes home, and hopefully the oxygen sat probe can come off soon. I got to hold him twice yesterday, and Joel held him once. He’s much more mobile now without so many tubes…we don’t even need any nurses to help us anymore. We can just go in there and pick him up and snuggle him as much as we want! 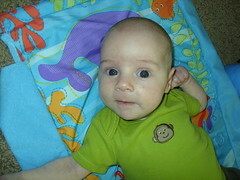 The other major milestone today was that Abe had his first breast milk from a bottle! 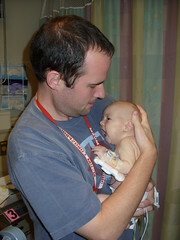 The surgeon stopped by and we asked about feeding, and he said he was fine for Abe to try 1 oz every 3 hours. He had 1/2 oz for me and 1/2 oz for Joel (and wouldn’t wake up when the nurse tried to feed him). So far it hasn’t come back up. He got another suppository to keep his system moving, but it appears he pushed it right back out because the nurse found it in his diaper. Little stinker. ;) Joel and I went out for a date night tonight – our first one since becoming parents. We figured we better take advantage of these highly-experienced and expensive babysitters while we can. 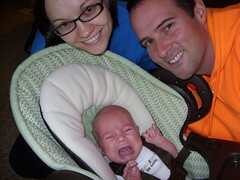 We went to see the movie Courageous, which is a great movie for new parents. We really enjoyed it. It was good to get out. We’re so thankful for Abe’s incredible progress. It’s hard to believe that it was just over a week ago that he had surgery. He’s come so far since then! We praise the LORD for what He’s done in little Abe’s body through the medical professionals and technologies. One of the nurses tonight told us that Abe’s doing really well for a baby that’s gone through what he has. Thank you, Jesus! To God be the glory! We don’t want to bombard you with e-mails from us, but Abe is doing so well we had to send an update. 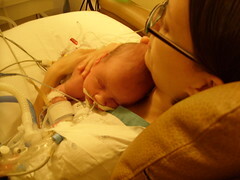 On Saturday Abe’s right chest tube was put to water seal (a way to test that it’s not needed before actually taking it out), and he only had morphine once during the day, and that was before another snuggle time with Mommy. He’s still not a fan of being moved, but usually settles in quickly. His replogle tube (the one that suctions the stomach) still has to be replaced every once in a while, but they’re watching it closely so they catch it quickly. On Saturday evening his blood gases were so low, that they changed his vent settings to 18/6 and 50 bpm (from 20/6 and 60 bpm), and when they checked half an hour later his gases were good, so they lowered him to 40 bpm before the next gas and they STILL looked good! They also took off the O2 sat probe on his right hand since they don’t have to compare the two O2 sat numbers anymore. One less wire! Sunday was another good day. Abe continued to tolerate the vent changes well and didn’t need to increase any of the settings. His right chest tube was taken out in the morning (woo hoo! 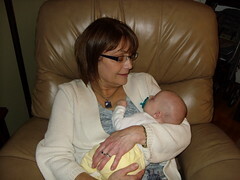 ), and he had a stool in his diaper when Joel changed him at noon. It was funny because the surgeon had just called to check on him and told the nurse to “slip him a suppository” to help keep his bowels moving. Abe must’ve heard because he didn’t have to have the suppository since he showed that his system was working on its own. 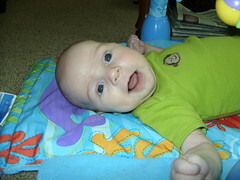 He’s also been tooting more, which is encouraging to us because it means that his bowels are working to some degree. His pain medicine was decreased from 4.0 to 3.2. It’s good to start on the weaning of the pain med because it could be a long process, depending on how much withdrawal he demonstrates (it’s a narcotic....a necessary evil). 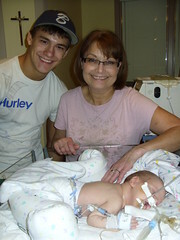 The other major event was that Abe was moved to the main part of the NICU! He doesn’t need his own room anymore because he’s not as sensitive to stimulation (light, sound, touch) anymore. We’re a little sad because we liked having our own space, but it’s a good sign that he got kicked out of the little room. 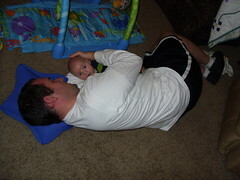 Abe and Daddy got to snuggle last night. 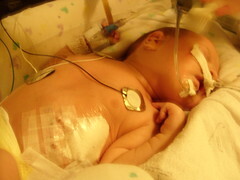 They changed his vent to 30 bpm early this morning before they checked his blood gases, and he did well with that, too. He was awake and alert for a good part of the day yesterday, too, which is so fun to see. Thanks once again for your prayers, support, and encouragement. It’s amazing what a difference it makes for us! Joel is hoping to start doing some work remotely this week, so pray that we can figure out how that will best fit into our schedule. Also, since Abe has moved, his new room number is 4709, so mail can be sent there. We love you! I wrote the above update in the morning before we went to see Abe, and there have been some pretty major changes since then. Instead of re-writing it all, I’ll just add to it. Please pray that Abe exceeds expectations now that he’s breathing on his own, and that he doesn’t need to be reintubated. Also pray for his physical comfort and that he’ll be able to rest well and continue to heal from surgery. 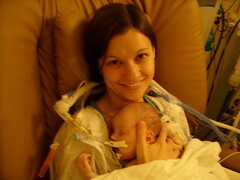 This is the first time that Abe was held after surgery. We’ve been reading to Abe quite often. Since Abe is 3 weeks old today, we thought it was time for another update. Overall, he’s done well, and there haven’t been any major setbacks. 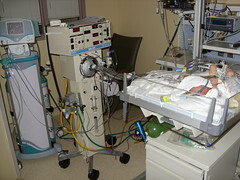 Yesterday they lowered some of his ventilator settings (from 20/6 to 16/6.....I haven’t figured out what all those numbers mean yet) and changed the setting so that he was more in control of his own breathing. His first blood gases an hour after the change looked good, but by the end of the day his CO2 was high, so they ended up switching him back to his original settings. (Poor guy had to have his heel poked about 4 times in as many hours.) I got to hold him yesterday afternoon, too! 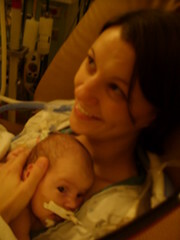 It took 3 nurses to help us get situated, but it was wonderful and Abe did really well. His replogle tube (the one that suctions stuff from his stomach) has had to be replaced 5 times since last night because it wasn’t working. A valve gets plugged and then it doesn’t suction anymore. Fortunately, they’ve caught it pretty early so it hasn’t caused any major problems, but last night Abe was vomiting up green gunk since things were getting backed up. That wasn’t fun to watch, and I’m sure it has to taste horrible. Today there was some concern that part of his right lung collapsed again and that the right chest tube was placed correctly, but follow-up x-rays showed that both were fine. Praise the Lord! They would’ve had to replace the chest tube if it wasn’t where it was supposed to be. The surgeon also indicated that he’s seeing growth in Abe’s left lung. Hallelujah! Abe’s been given morphine pretty regularly today to keep him comfortable – I guess chest tubes are pretty painful. No changes were made on his vent, but if things go well hopefully by Sunday the right chest tube can come out. We haven’t made much forward progress as far as weaning anything, but I’m learning that not going backwards is a victory in itself. We’re counting our blessings, that’s for sure! We’re so thankful for the cards, e-mails, visits, calls, texts, and messages. It’s such an encouragement to us to read/hear them and know that all 3 of us are being covered in prayer. I often go back and re-read them when I need a little pick-me-up, so keep them coming! We’re encouraged by Abe’s progress but we know there are many hurdles yet to overcome. Abe’s surgery went well! The surgeon (Dr. Bufo) said everything went smoothly. He said only about one-third of Abe’s diaphragm was there, and that everything except his liver was up in the chest cavity, so his left lung bud is pretty small (he showed us with his fingers and it was about the size of a 50-cent piece). Our lungs continue to grow until around age 7 or 8, so Abe’s lungs should mostly “catch up” by then. Since it was such a big hole, they had to put a collagen patch in to replace the diaphragm that was missing (Dr. Bufo said that 10-15% of diaphragmatic hernia repairs require a patch). Eventually Abe’s own tissue will grow over it and will “eat away” the collagen. They took Abe’s appendix out, too, because it wasn’t in the right place when everything else was situated. 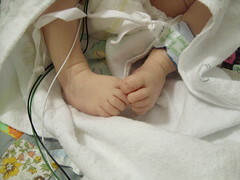 He has a chest tube to allow fluid and air to drain out of his chest, and he has another IV line in his foot. Again, Dr. Bufo said the first 24 hours usually go well, and then the roller coaster starts up again. The major concern is pulmonary hypertension, along with heart function. We were able to see Abe almost right away after surgery, which was a blessing. He’s got about a 2-3 inch incision below his rib cage on his left side. That’s a pretty significant incision when you only weigh about 8 pounds! The liver stayed put! I was looking at a few abdominal anatomy pictures online, and that’s a huge organ compared to the others. We are overwhelmed by all the prayers and support we’ve received. Thank you for recruiting more prayer warriors for us. It’s humbling to know that there are so many people who don’t even know us who are praying for us and for Abe. We’re blessed to have such loving and faithful family members and friends. We love you and are grateful for your prayers on our behalf! Just a quick update to let you know that Abe’s surgery is scheduled for Tuesday (tomorrow) at 9:30 AM. We met with the surgeon (Dr. Bufo) this afternoon, and he expects the surgery to take about 2 hours. 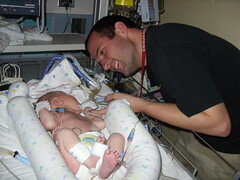 He explained that most babies do well for the first 24 hours after surgery, but then the going gets tough. 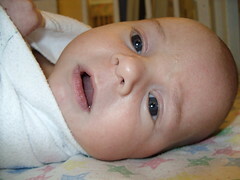 Dr. Bufo said that survival is still 50/50 at this point for all babies with diaphragmatic hernia. Please be praying for Dr. Bufo and everyone else taking care of Abe while in the OR, no complications during surgery, no infections or other setbacks, quick healing, and most importantly for Abe as he’s the one who has to go through all of this! Thank you so much. We’ll keep you updated as we’re able. We love you guys! Wow! It’s been a busy week with more ups and downs on the NICU roller coaster, but the dips haven’t seemed as drastic (or else we’re getting used to them). Abe’s current status: He’s on a conventional ventilator (no longer on the oscillator) with oxygen support generally in the 20’s, and his nitric is at 3. The surgeon wants him to be off nitric for 48 hours before he’ll do surgery, and with the weaning schedule the earliest that would be is Tuesday. Joel and I have each been able to hold Abe, which is wonderful! 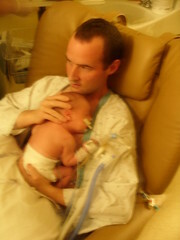 We’re doing Kangaroo Care, so it’s skin to skin. Abe is a little heater! Now for those who want more details, I’ll try to give a quick rundown of the major events of the past week. It’s a little taste of what the roller coaster is like. Sunday: Nitric decreased to 10, amp on oscillator decreased to 28, oxygen support in the 30s-40s; Abe’s heart rate was higher, so they increased his pain med; Abe had a slight fever in the afternoon so they sent out blood, urine, and aspirate (the stuff they suction out of his lungs) cultures and started him on antibiotic to be safe; Mom got to change her first poopy diaper (of Abe’s, anyway)! We’re so appreciative of the cards and gifts being sent our way. We’re overwhelmed with your love, prayers, and support. It’s such a blessing! We’re already learning that it’s all about Abe.....all our mail goes through him, since he’s the patient. You can use his room number (4716) and name when sending things to the hospital. It’ll still get to us if you use our room number, but may take a little longer since we’re not in the system. Praise that Joel and I are able to snuggle our baby! Thank you for your prayers, love, and support. It really does make a difference. We’re able to handle all the ups and downs because of our faith and trust in our great God and because He uses all of you to encourage us and demonstrate His love to us. We’re blessed! Also, just for fun, here is another movie that we’d like to share: the performance of “Abraham” from the motion picture Holiday Inn (1942). 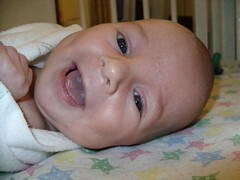 The NICU roller coaster has been in full swing the past few days, but fortunately we’re on an uphill climb right now. Abe had another rough day on Wednesday. His nitric was increased back to 20 and his O2 support was pretty high. They started positioning him on his side to loosen the secretions in his lungs to be able to suction them out. When Abe has a rough day, so do we. It’s hard to know that he’s not doing as well as we want. Thursday was better with no more setbacks but no huge gains, either. The surgeon (Dr. Karl) recommended flipping him onto his stomach to help move the secretions and decrease some of the pressure on his lungs. They were able to get more secretions out, which is good. The doctor gave us a report from Abe’s echocardiogram on Wednesday, which was encouraging! The pulmonary pressure was down significantly, which is a good thing. Today – 1 week already! – Abe had another good day. They decreased the amplitude on the oscillator to 35. This means that Abe is needing less help in keeping his blood gas levels where they should be. They flipped him twice today (from back to stomach and back again), which he did NOT like. He needed extra oxygen during and shortly after the flip, but he recovered much more quickly than previously. Dr. Karl is pleased with his progress and that he’s trending in the right direction. Still no date for surgery, but we’re getting closer. His nitric is still at 20, but Dr. Karl indicated that it might not even be helping Abe that much, but they don’t want to mess with it right now since he’s doing so well. 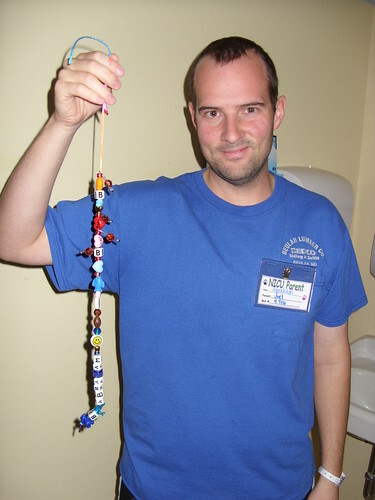 Every day, Abe gets “bravery beads” to document the different procedures and milestones he’s gone through. We’ll be able to take the beads home with us when Abe is discharged from the NICU as a record of his NICU stay. 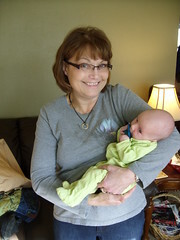 The program is sponsored through March of Dimes, and more information can be found at www.braverybeads.com. 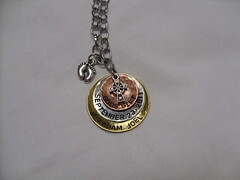 They sell necklaces in the gift shop (and online) to support the program. I haven’t gotten one yet because I hardly ever wear jewelry, but I’m considering it because it is a neat program. 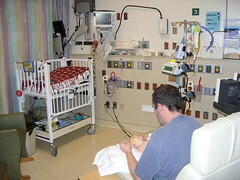 With flu season just around the corner, the NICU has some stricter visitor guidelines. They’ll be more picky about people visiting when they’re sick, and we’re limited to only 4 visitors a day. You can still visit us, but may not be able to see Abe. We also try to limit his stimulation if he’s having a tough day or is recovering after being flipped or some other major event. We covet your continued prayers for Baby Abe and for us, too. 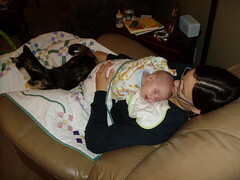 We’re grateful for the good reports and are eager for our little boy to get better soon. We still have a long way to go, but we’re taking it 1 step, 1 day at a time. We appreciate your love and prayers so much! 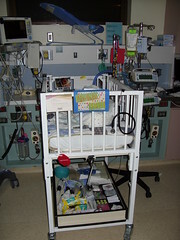 This is Abe’s setup in his room in the NICU. As you can see, there is a lot going on here. 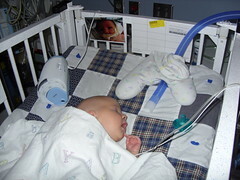 There are machines that keep him warm, give him nutrients and monitor his vital signs. In this photo Abe has a cloth over his face because he is very sensitive to light. He is also sensitive to sound so he wears an earmuff over his ear, too. His room is kept as dark and quiet as possible. 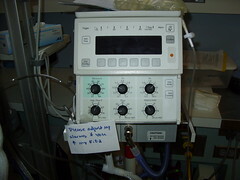 However, there is constantly the rythmic sound of the breathing machine and often loud dinging noises from the monitors. These are the breathing machines that are keeping Abe alive. Overall, Abe is doing well. He still has a long way to go, but he’s doing better than he was on Saturday. Since then, they’ve lowered his nitric oxide (a gas to help reduce pulmonary hypertension) and they discontinued his blood pressure medicine, and he’s tolerated both well. When we visited with the neo on Sunday, he had been thinking he would have to refer him to Minneapolis, but fortunately Abe pulled through and is still in Sioux Falls! Joel and I have enjoyed being with Abe today since he’s had his eyes open a little bit. His face is a little swollen, especially on the side that’s on the bed, but that’s expected. They’ve flipped him once (it takes 4 people! ), and hope to do it every day or every other day, depending on how he’s doing and what he’s tolerating. Today I also got to help change his diaper (his urine output is good), and Joel and I both were able to swab some breast milk in his mouth. He isn’t getting any nutrition orally because they want to keep his stomach as small as possible to allow the left lung room to grow. In fact, they keep his stomach suctioned. He gets IV nutrition (sugar, hydration, lipids), but they recently started swabbing the mouth with breast milk because the mouth is so vascular and can absorb the breast milk even though he’s not swallowing it. We’re grateful to be able to help take care of him. Joel told him today about his Biblical namesake, and that Abraham obeyed God in leaving his home to go wherever God told him. Our journey with our Abraham is similar in that we’re trusting the LORD to lead us, but we have no idea where the next step is going. We also pray for Abe every time we’re with him, and this afternoon when Joel said “Amen,” Abe opened his eyes like he knew the prayer was over. It was pretty cute! For those who want more details.....Abe’s blood gases are checked regularly throughout the day (looking mostly at CO2 and O2 levels), and based on what the numbers are, the settings of the nitric and oscillator are changed. After his rough day on Saturday, they were able to lower his nitric from 20 (the highest level of support) to 10. It hasn’t changed since then. 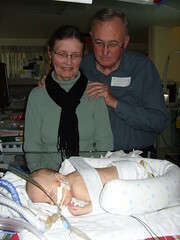 His oxygen is around 45%, and the oscillator is around 9. They constantly tweak the settings throughout the day, so there’s some variance but there haven’t been any major changes recently. Dr. Dosado explained that in weaning Abe from the nitric, they decrease by 5 until the last 5, when they decrease by 1 with at least 12 hours between to make sure he’s tolerating it. After he’s weaned from the nitric, then they’ll work on weaning him from the oscillator. We’re not exactly sure how that works at this point....we just take it 1 step at a time. No one’s saying when surgery will be because it all depends on Abe’s responses. It’s sounding like it won’t be anytime soon, though.....I would guess at least a week yet. Abe’s had extra fluid in his lungs that they’ve been suctioning every 2 hours or so. We don’t want him to need so much suctioning because it affects his O2 sats, which they want to be above 90. 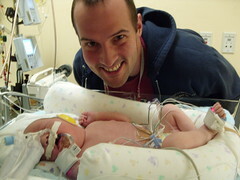 Joel and I are able to stay in a family room right in the NICU, so we’re close to Abe and can visit him often. It’s such a blessing! (For those who want to know, we’re in Room 4410 in the NICU at Avera McKennan Hospital, 1325 S Cliff Ave, Sioux Falls, SD 57105). If you’re in the area and want to stop by, feel free, but know that we can’t visit Abe between 7-8 AM or PM when they do shift changes, and that I have to pump regularly so am unavailable at those times. Thank you all for your love, prayers, encouragement, and support. We appreciate the Facebook comments and e-mails and would love to be able to respond to each of you individually, but right now we’re focused on spending as much time with Abe as we can. Know that we are encouraged by your responses and are so grateful for all your prayers. We’re so thankful for having you as part of our support system....it really does make a big difference! 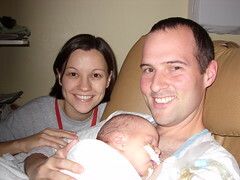 Our first family photo taken a couple minutes after Abe was born. Abraham Joel Molascon was born Friday, Sept. 23 @ 9:35 am. He weighed 7 lbs, 3.3oz. and is approximately 20" long. He has brown hair and brown eyes. We think he has his dad’s cheeks and hairline and his mom’s face shape. He’s pretty handsome! Overall, Abe seems to be doing okay. There have already been some ups and downs in regards to changes on ventilator settings and support. He’s on an oscillator with nitric oxide. This is a fairly high level of support. He’s getting medicine to help his heart contract well to transport blood/oxygen where it needs to go, and he’s also getting pain meds and sedation so that he doesn’t try to fight the oscillator by breathing on his own. He has lots of tubes and monitors. 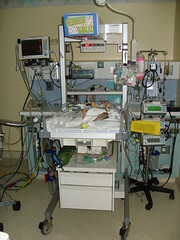 But he has his own room in the NICU and his own nurse....he already has the women serving him hand and foot. 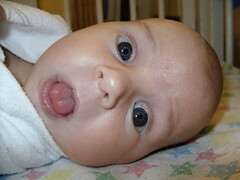 ;) The neonatologists (neos) we’ve worked with so far have been very informative.....we have a bit of information overload. Right now they’re trying to stabilize Abe as far as not having to change the oscillator settings, and for his heart and lungs to function the way they’re supposed to and to give the left lung opportunity to grow. Then they’ll work on weaning him off the nitric oxide, oscillator, and other meds before surgery. Already today the neo talked about the possibility of referring him to Minneapolis Children’s, and that he would do it sooner rather than later so Abe would tolerate the transport better. As they told us before he was born, it all just depends on how Abe responds to everything, and it’s hard to predict what will happen. Joel talked with the surgeon, and he made it sound like quite a bit of bowel was up in the chest cavity, so Abe is definitely fighting an uphill battle. It sounds like things can change quite a bit during a day, so we’re not sure how often we’ll be sending out updates. I’ll be discharging from the hospital tomorrow, and we’re not sure where we’ll be yet.....possible in the NICU or maybe the Ronald McDonald House. Thank you so much for praying for all of us. We’re so appreciative of them, especially for Abraham. We continue to trust the LORD with his life.